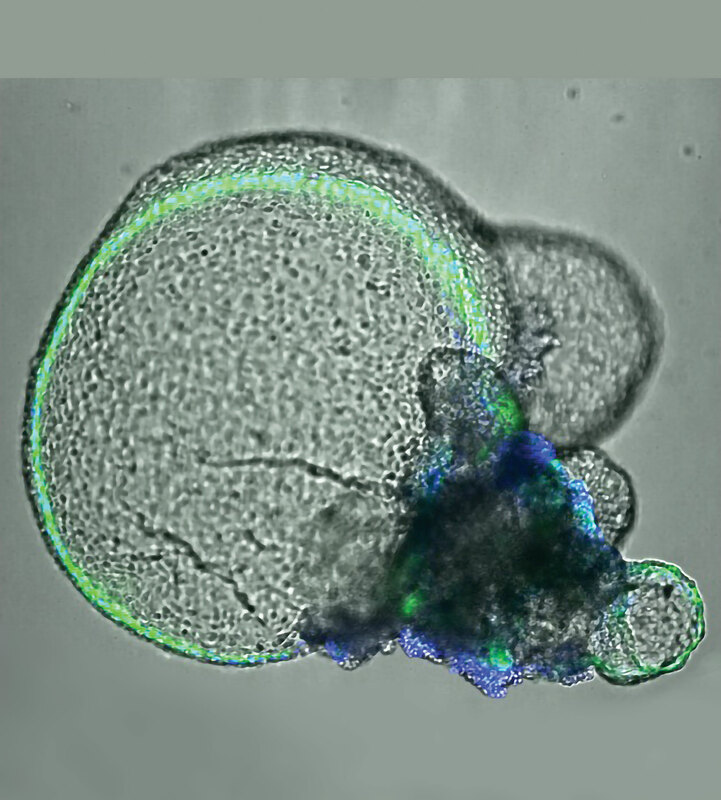 At the University of Washington, Benjamin “Beno” Freeman, PhD, and colleagues are using CRISPR gene editing technology to establish “disease-in-a-dish” models such as this 3D kidney organoid, which shows signs of polycystic kidney disease. Gene therapy, like a car with mechanical problems, has a history of jerking to life and then quickly stalling. Fortunately, gene therapy has the benefit of a kind of roadside assistance, one that comes in the form of gene editing technology, which is becoming more precise. It can help gene therapy run more smoothly. For example, gene editing can now be used to silence or repair a faulty gene, rather than insert an entire gene into the genome. (If a replacement gene is poorly placed, it can cause insertional mutagenesis.) Several forms of high-precision gene editing can give gene therapy a jump, but the most electrifying form is probably CRISPR. CRISPR is relatively affordable and easy to use. Consequently, it is being embraced by researchers, who are enthusiastically tinkering with CRISPR system components and developing CRISPR systems that are more efficient—and versatile. Besides dissecting normal and pathogenic pathways, uncovering biomarkers, and identifying drug targets, CRISPR is starting to translate into the clinic. In February 2019, CRISPR Therapeutics and Vertex Pharmaceuticals achieved a major landmark by announcing the first dosing of a patient with a CRISPR-Cas9 therapeutic in a Phase I/II trial. The therapeutic, CTX001, is being used to treat patients with β-thalassemia. Later this year, the trial will be extended to include patients with sickle-cell anemia. Other CRISPR biotech companies, notably Editas Medicine and Intellia Therapeutics, are also entering the clinic. These companies, which are focused on gene editing therapies for diseases of the eye and liver, share with Sangamo Therapeutics, Cellectis, and Bluebird Bio an interest in developing earlier forms of gene editing technology. These companies are relying on tools such as zinc finger nucleases (ZFNs), transcription activator-like effector nucleases (TALENs), and meganuclease–TAL effector fusions (megaTALs). Although the older forms of gene editing technology are still relevant, the relative ease of use and affordability of CRISPR-Cas9 suggests that CRISPR will swiftly prove the most abundant platform for gene therapy. Investigators at Exonics Therapeutics recently reported very promising preclinical data using CRISPR gene editing for treating a canine model of Duchenne muscular dystrophy, in which genetic correction of the dystrophin gene appeared to restore limb function in affected King Charles spaniels, supporting advancement to the clinic. Not only is CRISPR restarting gene therapy, it is also establishing a virtuous cycle of technological development. CRISPR has advantages that recommend it to a growing user base, which is working to enhance CRISPR strategies, methodologies, and nucleases, which keep broadening CRISPR’s appeal, and so on. This cycle may ultimately bring the benefits of gene therapy to patients, including patients suffering multigene disorders. The kidney is particularly challenging to study. The early stages of kidney disease are difficult to see, and patients with advanced stages of kidney disease often have secondary complications that affect disease understanding. An experimental system must recapitulate some of the kidney’s complex composition and functions. The Freedman laboratory helped to develop the 3D kidney organoid technology that fulfills this need. Kidney organoids are made from stem cells; multiple cell types develop in a relatively intricate nephron-like arrangement that looks similar to the types of structures seen in the kidneys. The geometry can differ depending on growth conditions, but all kidney organoids are essentially the same regardless of the laboratory of origin. Results are reproducible from laboratory to laboratory, lending standardization and credibility. Using single-cell RNA sequencing and other tools, researchers have found that organoids naturally make about 15 of the approximately 30 types of cells within the kidney. Although there is a contribution of genetics to any form of kidney disease, 10–15% of kidney disease is caused by single-gene mutations. If these mutations could be corrected, a big dent would be made in the number of transplants needed. But CRISPR, while more efficient than other technologies, is still not 100% precise—off-target effects remain a concern to many investigators. Polycystic kidney disease (PKD) is one of the most common genetic diseases, affecting 1 in 600 people. PKD has few treatments and no cure, making it a good candidate for a gene therapy approach. The genes that cause the disease are known, but it is not known how they normally work in the body. Approximately 75% of all monogenic mutations are caused by point mutations—missense, nonsense, and frameshift mutations. Ideally, these disease genes should be corrected directly at their endogenous loci. Homology-directed repair (HDR) has low repair efficiency. The dominant repair pathway in cells is usually non-homologous end joining (NHEJ). In theory, this repair mechanism should restore the open reading frame (ORF) that is disrupted by a particular disease mutation in approximately one third of the indels. NHEJ should lead to a significant number of ORF reconstitutions. Although HDR can be utilized for its precise gene repair mechanism, the efficiency is low and requires a positive selection to enrich for gene-corrected cells. This low efficiency arises from double-strand break (DSB) repair in mammalian cells predominately occurring by NHEJ. More importantly, NHEJ represents the dominant DSB repair pathway in hematopoietic stem and progenitor cells (HSPCs). Furthermore, the donor template required for HDR introduces a risk of random integration. For that reason, the donor-template-free RGN approach is a better strategy for the potential use in personalized gene therapy, Sürün believes. Currently, the delivery of Cas9 into stem cells proves to be the greatest challenge. Ideally, RGN delivery for gene therapy should be transient and virus free to avoid insertional mutagenesis and immunological side effects. Special consideration should be given to alternative RGN delivery strategies for future experiments. Advanced electroporation strategies are most promising. RGNs can be delivered as preassembled gRNA/Cas9 protein complexes. Next steps are to test this strategy in patient-specific HSPCs that will be transplanted after ex vivo gene repair into immunodeficient NSG mice. Genome-editing tools open a wide range of new possibilities in gene manipulation including target-specific gene repair. The results of the first gene therapy studies in patients will be decisive for the further usage of the CRISPR-Cas9 system. According to Sürün, the new Cas9 protein versions hold great promise because they show less off-target activity in cells. CRISPR-Cas9 is a transformative tool that will continue to operate at the leading edge of basic and translational research. According to Mark J. Osborn, PhD, assistant professor, Department of Pediatrics at the University of Minnesota, a recent study3 had the goal of merging the expression levels achieved with lentiviral transgenesis with the safety of gene editing. When a viral vector is used, it is common for multiple copies of the vector to deliver their payloads to individual cells. If these payloads include strong transcriptional elements, they can promote high-level, sustained gene expression. These elements, whether they are delivered by retro- or lentiviral vectors, often integrate into the genome with a bias for transcriptionally active regions, causing serious adverse events. In contrast, gene editing can result in precision targeting; however, the endogenous promoter may be comparatively weak, resulting in low-level gene expression. The Minnesota team inserted a powerful transcriptional element upstream of an endogenous start codon to drive high levels of gene expression with defined integration via HDR. Any nuclease has the potential for off-target effects due to overlapping sequence homology at other genomic loci. To reduce the potential off-target effects, Osborn and colleagues decided to rely on proper targeting to drive expression of a selectable marker that aided in selecting for proper targeting events. Osborn indicates that his team is further assessing its strategy by defining and mapping potential off-target sites. The hope is that the approach will streamline engineering and make high-level gene expression safer than when integrating vectors are employed. Identifying unwanted off-target effects remains an essential requirement for clinical translation of genome editing. Unfortunately, a well-validated method that can reliably identify these events in vivo has been lacking. Filling this void is a sensitive, unbiased, and generalizable strategy called VIVO (Verification of In Vivo Off-targets). Developed at the Massachusetts General Hospital laboratory of J. Keith Joung, MD, PhD, VIVO allows for the robust identification of genome-wide CRISPR-Cas off-target effects in vivo. VIVO was described in a 2018 Nature article,4 which demonstrated that CRISPR-Cas can induce substantial off-target mutations in vivo and that appropriately designed guide RNAs can direct efficient in vivo editing without inducing detectable off-target mutations. The VIVO approach can be used irrespective of the delivery method for CRISPR-Cas. It is envisioned as a two-step strategy: The first in vitro step uses the CIRCLE-seq method to identify potential off-target cleavage sites of a nuclease of interest on purified genomic DNA.5 Next, off-target sites identified by CIRCLE-seq are examined for evidence of indel mutations in the genomic DNA of target tissues in vivo that have been treated with the nuclease. The in vivo detection limit of VIVO is limited by the current error rate of sequencing. Previous in vivo studies used computational in silico approaches or the GUIDE-seq method performed on surrogate cells in culture to identify off-target effects. The results presented by Joung’s group provided the first convincing demonstration that CRISPR-Cas can induce significant off-target mutations in vivo, and, importantly, that these off-target effects can be eliminated with appropriately designed guide RNAs. 1. Cruz NM et al. Organoid cystogenesis reveals a critical role of microenvironment in human polycystic kidney disease. Nat. Mater. 2017; 16(11): 1112–1119. doi: 10.1038/nmat4994. 2. Sürün D et al. High-Efficiency Gene Correction in Hematopoietic Cells by Donor-Template-Free CRISPR/Cas9 Genome Editing. Mol. Ther. Nucleic Acids 2018; 10: 1–8. 3. Osborn MJ et al. CRISPR/Cas9-Based Cellular Engineering for Targeted Gene Overexpression. Int. J. Mol. Sci. 2018; 19: 946. doi:10.3390/ijms19040946. 4. Akcakaya P et al. In vivo CRISPR-Cas gene editing with no detectable genome-wide off-target mutations. Nature 2018; 561: 416–419. humans. In addition, the gene therapy approach must be tested for potential off-target effects. While an in vivo model can provide greater translatability of gene therapy studies (as compared to early efforts focused on cells or germlines), the species-specific nature of the genomic sequence can make such testing challenging. “Animal providers such as Taconic Biosciences are helping investigators overcome this limitation through genetically humanized mouse models, in which a human gene is inserted into the mouse genome, resulting in a druggable target,” says Caroline Horizny, PhD, Taconic Biosciences. A genetically humanized model can help to address species-specific differences between mice and humans, making in vivo testing of a CRISPR-based gene therapy more viable, she adds.